Transcription of extract from an article titled ‘Hitchen’s Coo-ees’ in The Wellington Times, Monday, 18 October, 1915, p. 3. Note: This extract also covers the recruiting meeting held on Saturday night on 16 October, 1915. There was a great gathering at the foot of Warne-street on Saturday night for the first of the recruiting meetings, but a start was not made until 9 o’clock to permit people from the shops to attend. A lorry was drawn up in front of Mr. Paul’s workshops, and on it were Alderman McLeod, the Mayor of Orange (Alderman McNeilly), Mr. H. M. Blackmore (secretary of the Wellington Recruiting Association), Mr. L. J. Astley (Dubbo Recruiting Association), and Mr. W. J. Johnson, formerly Federal member for the district, who was in khaki, and who had come to assist in the recruiting movement. Alderman McLeod mad a fervid appeal. He regretted that he was not able to go personally, but he had made sacrifices, as must be done by all. Alderman McNeilly (Mayor of Orange), Quartermaster-Sergeant Lee, Cr. Fuller, Mr. L. J Astley, and Private Johnson made stirring appeals in which the peril of the Empire was alluded to, and need for men strongly insisted on. There was another big meeting at Bell Park on Sunday afternoon when spirited speeches were made by Alderman McLeod, Adjutant Diehms (Salvation Army), Sergeant Barker, Quartermaster-Sergeant Lee, and Private W. J. Johnson. Mr. Paul read a stirring letter from the front, and there was cheering when it was announced that the D.C.M. had been awarded to Colin Farlow, and that another son of Mr. Angus Campbell had enlisted at Sydney. 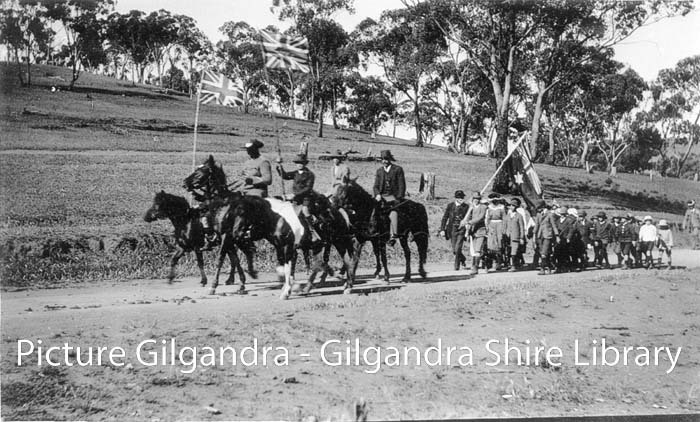 Then Mr. Hitchens returned his thanks for the treatment of the Coo-ees, and there was intense excitement when the chairman presented the leader with a Union Jack with the words “Wellington,” on it, and the National Anthem, and cheers for the King and the Gilgandra recruits closed a most enthusiastic meeting. This morning the Coo-ees left for Dripstone, and are due in Orange next Sunday. After the Coo-ees had left this morning six more recruits came into Wellington and passed the doctor. They were taken along the road to join the company, four being conveyed by Mr. C. J. Shakespeare in his motor car; one by Senior-Sergeant Nies in a sulky, and the sixth by Constable Griffin in another conveyance. With reference to the care of the recruits, Mr. Ferguson gave the Protestant Hall for their camp rent free, as well as the yard for the marquee for the officers, the Wellington Stores, Ltd., gave the use of the stretchers, and the procuring and arrangement of the beds were carried out by Messrs. A. Kennard and J. Bere, with the aid of assistants. Mr. R. M. Kimbell did the catering and cooked the food without charge, the flour being supplied by McLeod’s mill, and the bread baked by the firm above mentioned; while gifts of meat and other foods and money were liberally made by the tradespeople and residents. The recruits were served with plentiful meals during their stay, and a fine hot dinner yesterday, and Mr. Kimbell and his staff assisted by S. Green and J. Bere, did the waiting. The meals were served in the drill hall, which was decorated for the occasion by Mr. Stoddart and assistants. About 10.30 on Sunday morning the bands, cadets, and military headed the Coo-ees in a march round the town. There were special services at the churches yesterday. At St. John’s the Rev. E. S. Benyon, of Geurie, was the preacher. Father Eviston made reference to the occasion in the Catholic Church, and a united service of Presbyterians, Baptists, Methodists, and Salvationists was conducted at the Methodist Church, the preacher being the Rev. H. R. Grassick. Mr. Harry Taylor has consented to sell the impedimentia of the Coo-ees after their arrival in Sydney, and spell the horses used on the journey from Gilgandra, with the view to their subsequent disposal.